The Dusit Thani hotel on Sheikh Zayed Road in Dubai is one of the finest 5 star accommodation facilities in this desert city, where guests will also find a signature bistro called Benjarong Restaurant. This fine eatery serves the authentic royal food of Thailand in the heart of Dubai’s business region that has lip smacking taste and superior quality. Moreover, due to its prime location, Benjarong Restaurant attracts lot of people from the nearby shopping malls, leisure spots and landmarks like World Trade Centre, Dubai International Financial Center, Burj Dubai and etc. These people visit this restaurant to savour the finest taste of Thai cuisine, which have the true aroma and spice of Thailand to fully sate their craving for authentic food of the region. In addition to this, guests also get to enjoy the traditional dance and music of Thailand in the luxurious interior of Benjarong Restaurant. 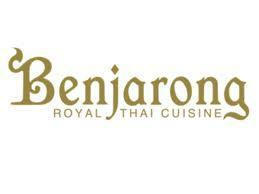 Benjarong Restaurant offers Royal Thai fare in an ideal setting, which is cozy and has a romantic ambiance too. Moreover, it has four dining areas, out of which three are private and one out of these three has a unique style low seating facility with cushions. These fine qualities make this bistro the signature restaurant of Dusit Thani Dubai hotel. Aside from authentic Thai cuisine, this casual dining restaurant also serves some South East Asian delicacies. To go with the food fine range of alcohol is also available on the menu. Traditional Thai music is played in the background all the time, even during the Business lunch hour. Plus smokers are allowed to smoke in this eatery. Lunch at Benjarong Restaurant starts around 12:00 in the noon and comes to an end at 3:00 pm, while the dinner begins at 7:00 pm and last till 11:30 pm. This restaurant follows these operational hours on all seven days of the week, as it opens daily. Dusit Thani, Sheikh Zayed Road, Trade Centre 2 - Dubai - United Arab Emirates. Head southwest after exiting from the dwelling of this metro station in order to locate the destination on the left side. 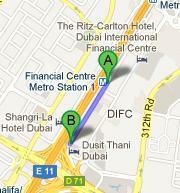 Wasl, Etisalat – Dubai bus stop is 800 meters away from Benjarong Restaurant in Dusit Thani hotel. This makes it a walking journey of about 10 minutes, once the bus user starts his or her journey from Wasl, Etisalat – Dubai after arriving at it by using any of these bus numbers 27 and 29. As far as the direction is concerned, visitors should head northeast direction from this bus stop and then take a sharp left turn before making a right turn in order to find the destination on the right side. See map for directions.